﻿ Figo: "Those who criticize Cristiano Ronaldo, know nothing about football"
15.12.2011» Figo: "Those who criticize Ronaldo, know nothing about football"
Luís Figo is convicted that Cristiano Ronaldo is being victim of a criticism campain and that the Portuguese player should remain calm and let the storm pass away. Real Madrid constant failures against Barcelona have been letting many fans impatient, but after last weekend's "Clasico", CR7 has turned into the main target of all critics. Not that he needs any kind of introductions, but the former Barcelona and Real Madrid player, Luís Figo, has also given voice to his disagreement towards all the criticism that keeps targeting Cristiano Ronaldo, after the 1-3 loss against Barcelona. Figo expressed his indignation with the way his countryman is being treated and outlined that those who insist on blaming Ronaldo for Real Madrid bad performance against Barça, simply don't know nothing about football. 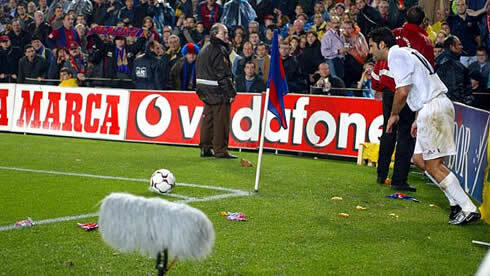 Luís Figo played for Barcelona between 1995 and 2000, reaching a very high status in the club as ended wearing the captain armband for several occasions. The Portuguese player had 172 appearances and 30 goals for the Blaugrana, just before surprising everyone with a summer transfer. A shock move to Real Madrid in 2000 turned him into a "persona non grata" in Barcelona from that point on but in the other side, he became one of the "Galáticos" in his new club. As a Merengue, Figo also had a 5 years journey, representing the club between 2000 and 2005, in a period where he won one UEFA Champions League, two La Ligas, but also the France Football Balon d'Or (2000) and the FIFA World Player of the Year award (2001). With a 10 years career in Spain, Figo certainly knows how much the pressure can affect a player and how hard it can be to deal with it. When analyzing what happened in the "Clasico" between Real Madrid and Barcelona, Figo intentionally focused in defending CR7 from the recent media attacks. Figo: "It's normal for any football player to have its own highs and lows. Those who	are criticizing Cristiano Ronaldo lately, know nothing about football. One single player can't please everyone at the same time. What's important is that Ronaldo remains conscient and aware of how important his work is for Real Madrid", noted the former Portuguese international player. These Figo statements took place when the Portuguese former player was promoting an event from his foundation ("Luis Figo Foundation") in Madeira, precisely the island where Cristiano Ronaldo was born and raised. Figo: "Cristiano Ronaldo is a symbol of Madeira and represents its culture in the best possible way." However, and when asked to leave a comment on the way Cristiano Ronaldo is captaining and leading the Portuguese National Team, Figo strangely decided not to share what he had in mind. Figo: "I would prefer not to comment. Everyone has its own way of being", replied the former Portuguese player, who in times, has also been a very respected captain in the National Team. Regarding the upcoming EURO 2012, Figo showed his overall confidence, despite a predictable hard task for the Portuguese National Team, after being drawn with the Netherlands, Germany and Denmark, in Group B. Figo: "It's hard to pick one opponent, but Portugal has always done well against strong teams, so I'm confident and I believe that we can do a great campaign in the EURO 2012", said Luís Figo when previewing Portugal chances to shine in this summer's big tournament. Real Madrid next game will be against Sevilla, for "La Liga". Cristiano Ronaldo is very likely to be in the line-up for this game, which will be held in the Sánchez Pizjuán. You can watch Juventus live stream, Sevilla vs Real Madrid this Saturday for "La Liga" and QPR vs Manchester United on Sunday, for the English Premier League. You can also watch Barcelona vs Santos for the FIFA Club World Cup final. All these games are available from our football live streams section.